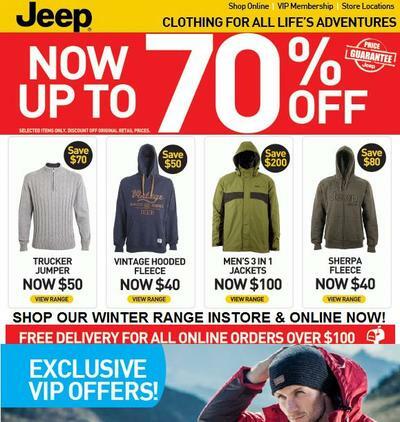 Jeep clothing up to 70% off - In store & Online! While every other company is after gold coins, Jeep also joins the EoFY sales bandwagon and provides some value for money, that you can use for purchases! "Don't hold back!" is what they say! Well, it's not really very easy to hold back from spending some monies to get a hold of their immaculate collection of clothing, now presented to you in beautiful designs and a variety of colors / sizes, at good discounts, in-store and online. I've always wanted to buy a Jeep automobile and that idea still remains unfulfilled in my bucket list. Even though that purchase eludes me, I'm already a fan of Jeep clothing. I always make my purchase around June, so I can own and flaunt my new Jeep collection! The current Jeep sale includes several varieties of jumpers, jackets, fleece, t-shirts plus some exclusive winter gear, for men, women and children. They're attractive in terms of choice and pricing too. Or present a gift voucher to a loved one, they're sure to appreciate you! To find your nearest store, you can click here. Offers valid until Wednesday 18 June 2014! Florsheim - End of season sale! Strandbags - sale upto 50% off! MARCELLA - Custom shirts for $39! Aussie Disposals - massive 1-day sale! KOGAN.com - Sale! Hot Deals from $1! ING Direct Orange Everyday Offer! Can you stand nails scratching on blackboard?